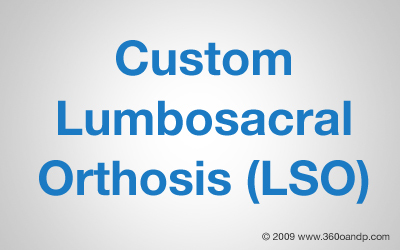 The custom fabricated lumbosacral (LSO) orthosis is a circumferencial brace design controlling the lumbosacral spinal area. Specific measurements and normally a cast is taken of the patient and used as a mold in fabricating the brace. 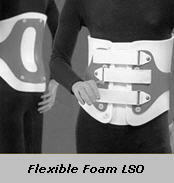 Materials usually used to fabricate the brace can be polyethylene, polypropylene, copolymer or surlyn to name a few. The choice would be up to your orthotist and physician, according to your specific requirements and the nature of the disability. If necessary, a foam liner can be incorporated. 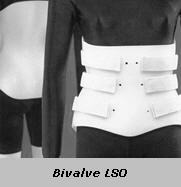 The bivalve LSO (anterior and posterior sections) is a very versatile orthosis and recommended for numerous spinal conditions. The design affords excellent adjustability with an intimate and comfortable fit. 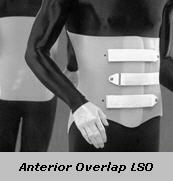 The anterior overlap design consists of a single opening anteriorly with Velcro closures. It is easy to don and doff and is gives good adjustability function. The LSO fabricated with a flexible foam material combines the rigidity of the traditional orthosis with the comfort of a soft body jacket. The exterior frame is removable and can be trimmed to improve anterior, lateral and posterior rotational control, as your particular condition warrants. 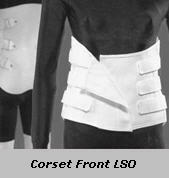 The molded posterior section with a corset-type front is a possible solution for the individual who cannot tolerate abdominal pressure. It is highly adjustable and comfortable to wear. Follow your physician and orthotists specific instructions. Your orthotist will give you instructions as to apply and removing the brace. Normally, it is advised to lay on your back with your knees bent to apply the orthosis tightening the strapping from the bottom up. Normally, cleanse with alcohol and clean cloth. Wear a cotton shirt underneath the brace to provide more comfort and better hygiene.